This is a guest post courtesy of Mr. Andrew Faiz, a biology teacher at East Boston High School. 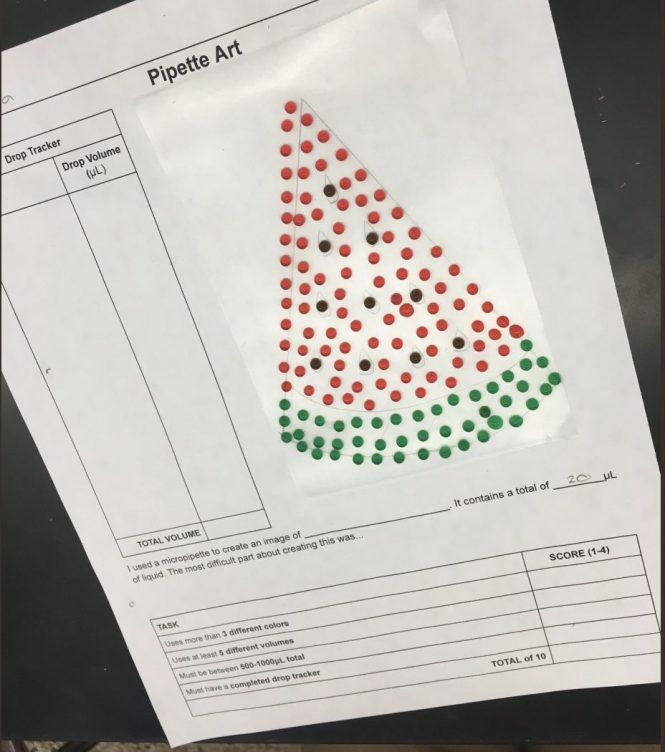 A big thank you to Mr. Faiz for this wonderful blog post, and for sharing your fun, practical class project that helps students learn how to use a pipette while exploring their creative sides! Stop! Wait…that’s actually a great idea! Part of me wanted to tell this student to stop, but my gut ended up just letting him keep going. We were learning to how to use a pipette using an activity created by MassBioEd’s program, BioTeach. After reviewing the anatomy of the micropette and doing some guided practice, the instructions were to micropipette specific volumes of dyed water samples into a grid. As I circulated the room of my first class of the day, I walked up to a student with his grid completed…and with scattered 10μL drops of blue and yellow on the outskirts of the Parafilm. He continued to use the samples to arrange drops in patterns to his liking. Initially, I cringed knowing that I had prepped the microcentrifuge tubes to last for all three of my classes. But when I looked back down at the Parafilm, I smiled, told him it looked cool, and continued circulating the room. 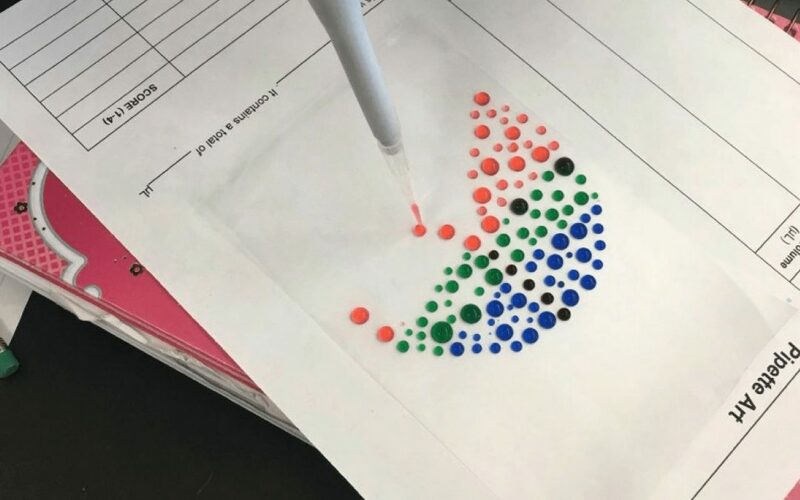 After I finished teaching that day, I created a micropipette practice activity where students could create a picture using drops of different colors. Because my students are English learners, there was a lot of modeling involved in providing the instructions, but I began by simply telling them that they were to practice using the micropipette to create a work of art. One of my students yelled out in confusion, “¿Arte?” I responded, “Sí, arte!” I provided an example on the board of what they were to do, and told them the rules: (1) at least 3 different colors, (2) at least 5 different volumes, (3) a total volume between 500-1000μL in drops, and (4) a completed drop tracker used to determine the total volume. In the blank space of the page, they first sketched what they wanted to create using the micropipette. Next, they placed a piece of Parafilm over their sketch in preparation for micropipetting their image. Earlier, I had emptied out our cabinets of all the beakers and set them out on a table. Then, students used water and food dye to create all the colors they needed and brought the beakers back to their workstations. With 2-20μL and 20-200μL MiniOne micropipettes in hand, they got to work! As students created their piece of art, I assisted only when necessary and observed their technique. I looked at how they held the micropipette, how they used the soft and hard stops, how they set the volumes, and how they steadied their hands. I observed and ensured that they changed tips between colors to get them into the habit of avoiding contamination. Some of these seemingly superficial observations actually led to deeper insights. For example, when I observed their frustration of separate drops accidentally combining into one, what I really witnessed was their problem-solving skills– they reset the volume to take up half the liquid, and re-pipetted the drop. And when I observed their struggle to get a drop to be the exact size they envisioned, what I really witnessed was the development of a keen eye for the visible size differences between very small amounts of liquids. This activity can easily serve as practice on how to use a pipette and a practical exam for proper technique, but I found that it also provides many other data points about students, such as their problem-solving skills, their creativity, and perhaps most interestingly, their patience! Over 60 minutes of tediously creating a work of art microliter by microliter requires megaliters of patience. The one challenge I did have through all this was ensuring that students completed the drop tracker. I expected them to keep track of drops to meet the total goal of 500-1000μL, but they got caught up in the art! Nonetheless, the results were impressive! Students micropipetted animals, abstract designs, their country flags, and other creative ideas. Turns out that sometimes off-task behaviors can inspire engaging tasks! As much as I’d like to take credit for creating this assignment, it truly was inspired by my students! Additionally, none of this would have been possible without the Massachusetts Life Science Center (MLSC). 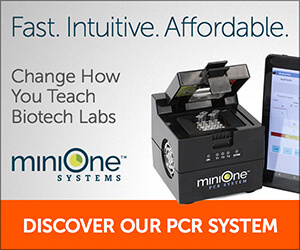 We received a grant from MLSC that enabled us to not only purchase all of our MiniOne biotechnology equipment, but also to train our teachers on how to use it in our classrooms. As a biology teacher in the biotechnology hub of Boston, and as a teacher of English learners in an urban public school, putting micropipettes in the hands of our students has been a momentous stride in increasing equity and access to quality, authentic science instruction. Furthermore, it has opened our students’ eyes to possible careers in biotechnology. Interested in another activity that helps teach students how to use a pipette? Click here to check out our Gel Loading Practice MiniLab. Thanks again to Mr. Faiz for sharing your unique and inspired classroom activity with us! Hello, I am not sure the download link is working. Could you please post again?